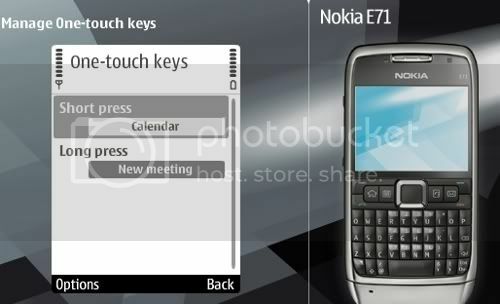 Thankfully Nokia and the designers of the Eseries have made it possible to change the one touch shortcut keys on the E71 to any applications or tasks you want. I'm talking about the 3 keys to the left and right of the pad. The messaging, contacts, and calendar key can all be customized to your liking. Great thing is each key can have two shortcuts. One for short press and one for long press. So in actuality you have a 6 shortcuts keys, not counting all the shortcuts you can have on the active standby screen. I think this is a great move by Nokia to allow more customization and efficiency. People that own Eseries devices are always looking for ways to get things done faster and find the shortcuts. Check out what I'm talking about under the Personalize section of this E71 demonstration by Nokia.